For those who are unhappy with the look of their smile, there are a few options on the table. One of the standard options, of course, is braces. Many people have used braces to alter the alignment of their teeth over the years, and there is no doubt that braces can do a great job. Of course, some drawbacks come along with the use of braces, which is why some patients seek out alternatives. 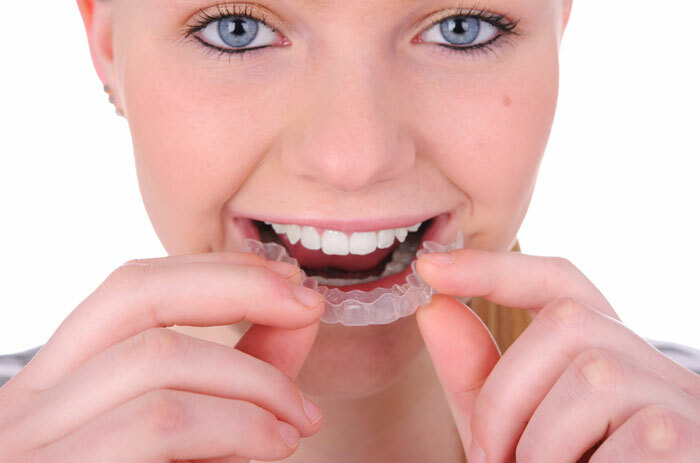 One such alternative is Invisalign, and it certainly offers a lot to like. In this post, we would like to highlight some of the many advantages of opting for Invisalign. This might not be the right solution for every patient, but it is going to be a strong option for many in search of an enhanced smile. First and foremost, one of the main advantages of Invisalign – and one of the reasons so many people have already taken this option – is the look. Or, to put it another way, the lack of a look. When wearing Invisalign aligners during your day to day life, there is a good chance that most people won’t notice you are wearing anything at all on your teeth. If you have been putting off having your teeth aligned with the use of braces because of what it will mean for your appearance in the short term, Invisalign is a great solution to that problem. While the fact that Invisalign aligners1 are hard to see while they are on your teeth is a big selling point, the aesthetic advantages don’t end there. Additionally, you can simply take these aligners out from time to time when you would like to look your best for photos or events. You do need to wear the aligners for the vast majority of the hours during a day if you are going to get meaningful results over time, but you are free to take them out on occasion, as necessary. That’s a great benefit to going in this direction, and something that simply isn’t offered when you go with braces. Anyone who has previously worn braces can tell you that the experience is not always a good one. There can be some meaningful discomfort to wearing braces, and it can take some time until you adjust to having them attached to your teeth around the clock. With Invisalign, much of the discomfort experienced with braces can be taken away. One of the big keys to the comfort of this system is the fact that, as mentioned above, you can take the aligners out if you need a break. With braces attached to your teeth, you can’t take them out on your own, and you may feel stuck when struggling to find comfort. Also, there are no harsh surfaces – like the brackets used to form braces – to damage the inside of your mouth as you go through day to day life. That means you shouldn’t have to deal with the cuts and abrasions in your mouth which are sometimes experienced when braces are the straightening method of choice. Overall, from start to finish, most people will find the Invisalign system to simply offer a more comfortable experience, while still enjoying great results when all is said and done. One of the biggest challenges encountered by many people who opt for braces is the fact that they are unable to eat some of the foods they love. It can be hard to give up some of your favorite foods, especially for what may be a significant amount of time. Yet again, this is a problem which is avoided by the use of Invisalign. To have the full use of your teeth for chewing power, you can simply pop out the liners and enjoy your meal. They can then be replaced when the meal is over, getting back to doing the job of aligning your teeth properly. This kind of freedom is such a big benefit to choosing Invisalign, as it makes it far easier to go about your regular day to day life for the duration of the treatment. For many, the idea of straightening teeth with braces is to gain confidence in the way they feel about their smile. That’s a great goal, and it is one which shouldn’t have to be deferred. The ironic thing about using braces is that you may need to feel worse about your appearance in the short term before you start to feel better. Adding braces to your smile probably won’t be something you’ll be proud of, so you will have to be patient in order to enjoy the payoff at the end of the process. With Invisalign, it will barely be noticeable that anything at all has changed – at least, at first. You can start treatment without drawing any attention, and you’ll only start to turn heads as the treatment begins to take effect and your smile begins to move into position. Thank you for taking the time to stop by our blog, and we hope some of your questions about Invisalign have been answered. Of course, there is far more to know then what we were able to include in this post, so feel free to contact us for more information or to make an appointment2. We are here to help!